Sound familiar? Of course it does. If you have a cat in your entourage, you know he loves to scratch. If you haven’t managed this behaviour already, he is definitely scratching your furniture and carpets, isn’t he? Wait…managed this behaviour? So, there’s hope? What makes a good scratching surface? Three things: Size, Shape, Texture. 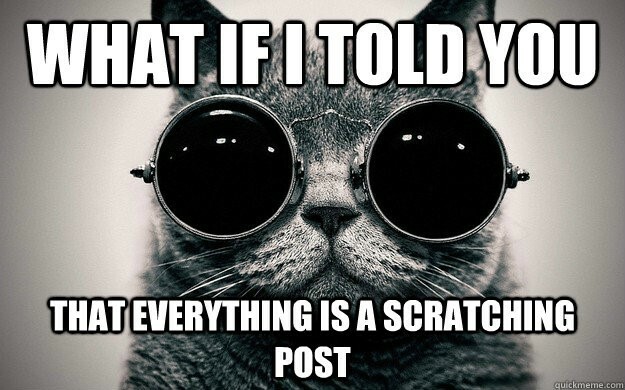 Cats like scratching posts that are taller than they are so they can get that really good stretch. If your cat likes horizontal scratching more (ex. he always scratches the carpet) try a long horizontal scratching board. For texture, cats tend to either like sisal rope, corrugated cardboard or…wait for it….carpet! Ok, so you went to the pet superstore and bought one of everything…and now you have this overwhelming fear that he may turn up his nose and act like he is too good for these new foreign objects. A cat would NEVER do that! You could slap a pretend $2000 price tag on the posts and pretend they are your new toys… or you could actually have him believe the posts are his and better suited to his needs. Either approach will likely work but let’s go with the latter. Place them near the areas he does most of his scratching. Give him variety with textures so you can learn his preferences. When he uses a post (believe me, he will want to try it at least once), reward him! If he scratches where you don’t want him to, don’t punish him. Gently pick up, take him over to his new scratching post and reward him when he uses it. Regular nail trimming – By regularly trimming your cat’s nails, you can prevent injury and damage to household items. Visit our nail trimming page for tips and a video. Synthetic facial pheromone sprays/ diffusers – If your cat continues to scratch on undesired objects, it may be related to stress, anxiety, attention seeking, or lack of perceived security in her environment. Anxiety can be intensified by punishment, thus driving your cat to increase her undesired scratching behavior. Consider trying synthetic facial pheromone sprays and/or diffusers to help relieve your cat’s anxiety or stress. Apply such products on the objects or areas in your home where your cat has exhibited undesired scratching. Do so after cleaning with soap and water to remove the communication marketing scents left by your cats paws. Applying daily comforting pheromones can prevent your cat’s need to mark these areas again. The product should not be sprayed on the desired scratcher you want your cat to use. Appropriate environmental enrichment – Make sure you provide your cat with an enriching environment so she has appropriate objects to scratch and play with in your home. Destructive scratching can occur if you cat’s needs have not been fully met. Temporary synthetic nail caps – these can be glued over your cat’s nails and usually need to be reapplied every 4-6 weeks therefore they may be a less desirable alternative to the other methods listed here. Rewards and positive reinforcement – Remember that your cat learns best through positive reinforcement. As you are redirecting your cat to use her new scratching post or pad, try and make sure you give your cat a reward immediately (within 3 seconds) to really reinforce the positive behavior. It is important to remember that you need to find a reward that your cat likes. Examples include: treats, catnip, interactive play, and petting or grooming. If after all this, his scratching behaviour is still destructive, he may have more serious underlying issues with stress and anxiety or he may not feel safe and secure in the home. Book an appointment with your veterinarian to go over your concerns and develop a plan to treat and manage these issues. In the end, you will sleep better, he will sleep better and you can get back to your selfies and Netflix without a care in the world.